Most guitarists are taught to play minor pentatonic or the flat 5 blues scale when soloing over a 1 4 5 blues progression. While this "does the job" as far as creating that bluesy sound, there is a far more effective and expressive way of playing through blues changes. It can be the difference between playing an ordinary blues solo and an extraordinary blues solo that really pricks up ears! It's certainly one of the key differences between the great blues players and the mediocre. But it's not a difficult concept to master. The video below will show you what, unfortunately, 90% of guitarists ignore in favour of playing the same old pentatonic/blues scale pattern over all three chords. Don't be lazy! Here's a nice, slow, 12 bar blues jam in A major to help you practice the elements we've looked at. To accompany the video at the top of this page, I've provided the scale diagrams from the video, tips and tabs of my phrasing examples to help cement what we learned. Start by learning where the chord tones are for each chord in the progression. 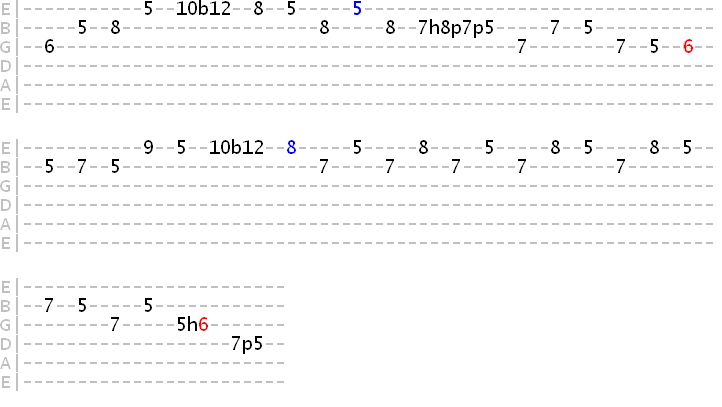 So we're essentially arpeggiating the 1, 4 and 5 chords to begin with. Nine times out of ten, these will be your strongest target notes through the chord changes. Remember, the root (1) note for each chord should be positioned at the appropriate fret for the key in which you're playing. For example, in the key of A, the 1 chord root will be A, the 4 chord root will be D and the 5 chord root will be E. You can learn more about how key determines the chords you play in the blues progressions lesson. The 4 chord root (A string) always lies on the same fret as the 1 chord root (E string), just one string up! First, arpeggios. We start by moving from the 1 to 4 chord (A7 to D7 in this ex. ), targeting the b7 chord tone of the 4 chord. Ok, let's embellish these arpeggios with the minor pentatonic patterns from earlier, still using the chord tones as target notes through the chord changes. So, the bottom line here is to use chord tones to keep your scale phrases connected to the chord changes. Rather than playing "over" the chords, you'll play "with" them. That's not to say you must always land on a chord tone, but just knowing where they are, in relation to the scale pattern, will give you that skeleton which you can then flesh out with phrases from the scale. More lessons on blues soloing below. Thanks for your time and patience.